... Bronco. The Beach Broncos allow you to keep your legs and arms free while relaxing in your swimming pool or favorite body of water. The slippery football is a popular beach attraction which will convert your beach into a center of recreation and attract large groups of vacationers. This game is for the most stable people – the winner is a team able to keep feet. Our Beach Tent creates an easily identifiable beach presence for your Wibit Sports Park operators to register new guests, while providing shade from the sun. buoy water toy / inflatable PRIVATE ISLAND 120"
On NauticExpo, a water toy is a recreational apparatus, sometimes inflatable, including slides, trampolines and mattresses, as well as jet boards, motorized kayaks and more unusual contraptions. Most of these devices are intended for beach rental companies, though some might also interest individuals. 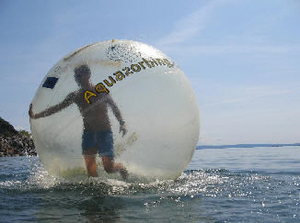 Manufacturers are continually creating ever more imaginative, original and thrilling water toys. Motorized surfboards, flying water jetpacks, inflatable bubbles and other contrivances.